Just to the right you will see the new National AMBUCS tagline and mission statement unanimously approved by the National AMBUCS Board of Directors at the National Conference in Reno, NV, under the leadership of Past National President, Kevin Sheehan. That’s right, as you will notice we have removed ‘disabilities’ from our tagline and mission statement. Words matter. Sometimes we forget their power – for good or for ill. But if you’ve ever been a child on a playground, and I know you have, you know that power. Our crisis of words is hardly a new one for an organization that serves those challenged with mobility and independence. The AMBUCS Resource Center has a wall of bookcases full of memorabilia from our near-century of existence. A quick survey reveals frequent use of “handicapped” and “crippled.” We would never use either word today, but when the pieces were produced the words were perfectly acceptable. Over the past few years, we began to get similar feedback from therapists, parents and other members of the community. The word “disabled” had started to become stigmatized…like every label before it. The community has begun advocating for itself and one another as human beings, reframing descriptive words or rejecting labels altogether. This choice is highly personal, however, and a label that one person finds acceptable may be deeply offensive to someone else. I think it is safe to say that every AMBUCS member has been touched down to their metaphorical toes by those we serve. While the word “special” has also become stigmatized, it is so true in its original context. The people we serve are all wildly different (like any group of humans), but it seems to me that conquering extreme daily challenges tends to create a type of person I admire very much. They are often determined, game, humble, kind and open. The VERY last thing any of us would want to do is place a hurtful label on one of our friends. The National Board and staff wondered if the word “create” was also a bit disempowering – making it seem like all the magic comes from our members and not from the determination of those who round the bases, travel ramps, power trykes or provide therapy. 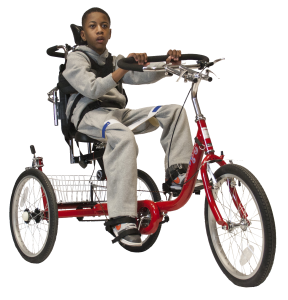 So, what does National AMBUCS do with its proud mission to Create Mobility and Independence for People with Disabilities? As previously mentioned, the National Board unanimously approved the new tagline: Inspiring Mobility & Independence. 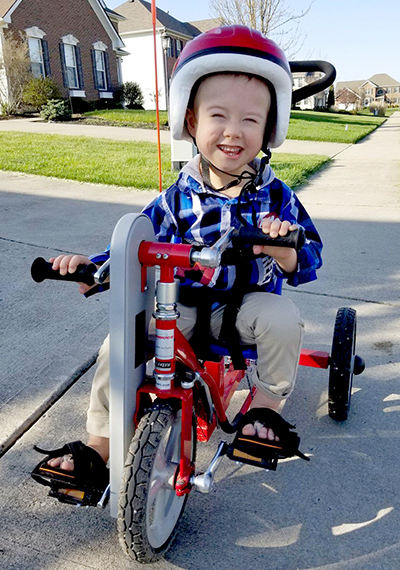 Inspiring people to conquer challenges related to mobility and independence, through a nationwide network of volunteer chapters, working in partnership with physical, occupational and speech therapists; by providing Amtryke adaptive trykes, scholarships for therapists and many forms of community service. The announcement of the changes was made at the Thursday General Session at National Conference, before our keynote speaker, Shana Anderson, took the stage. Shana spoke about her experience as mother to Reeve, who faces challenges related to Down syndrome, and about advocating for those with chromosomal disorders through a venture called Reeve’s Tees. She recounted her experience with two amazing AMBUCS chapters; one gave Reeve an Amtryke (Greenebucs) and one invited him to participate in a triathlon (Miamibucs). Shana’s piercingly open account of her experiences and her clearly genuine gratitude to our organization and others like us, captured every heart in the room. We hope other people we serve have a similar overwhelmingly positive response to the change. And that you, like Shana’s audience, feel like rising to your feet and giving her statement a standing ovation. However, we understand that the new tagline and mission statement create some hurdles for our chapters and members. You will find updated AMBUCS and Amtryke logos here. You do not need to reproduce existing materials. We just ask that when it is time to replace them you use the new logos. We will be doing the same at the Resource Center. It may take some time to internalize that longer mission statement. You probably already have the tagline memorized so you can start using that immediately. To begin with, you could probably easily paraphrase the mission statement since it encapsulates the organization you know so well! Lastly, you are not alone if you are wondering how to talk about AMBUCS without using “disabilities” or another label to describe the population we serve. It will probably be a slow burn. We suggest you think in terms of challenges faced and overcome rather than labels, as I have tried to do in this document. “People who face challenges” or “…challenges related to…” Or simply let mobility and independence stand alone. Our ear is trained to listen for the “for” but I think you will find most people will understand intuitively that we inspire mobility and independence…for people who are challenged with those issues. I hope you are as proud as I am of this new AMBUCS era. Maybe this change will serve as an example to other organizations and we will find in years to come that we were at the forefront of an important movement to remove labels and celebrate not only the human dignity but also the uncommonly amazing qualities of those we serve. Today, my friend, is a GREAT DAY to be an Ambuc! Our most popular model! The ProSeries 1416 features full trunk support and a rear steering kit can be added! Copyright © 2019, NATIONAL AMBUCS.